Packing Shims BPL packing shims are produced in two formats. Individual shims or as uniquely designed ‘bend or break’ shims. 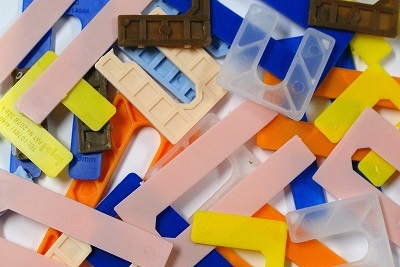 The plastic shims are moulded in polypropylene to resist compression and contamination from the wet trades. The flat horse shoe shape is ideal for locating around fixings when packing around window and door frames or even behind skirting board and architraves. Ignore the slot and you have a general purpose packer suitable for lining up floor or wall tiles, or levelling boards, floors joists and kitchen units and so on. BPL Packing shims are used extensively throughout the construction industry as an alternative to ‘the anything will do packing piece’. When using two or more shims the unique ‘bend or break’ feature takes on a soft spring effect that will defy gravity by gripping the sides of the clearance gap that requires packing, prior to fixing.